You have the option to work with both of us (Amanda and Ron) in the room with both of you. This is called the Co-Therapy model (or sometimes the Conjoint Therapy model). We find this model can help in understanding couple dynamics and the ways in which each individual triggers the other. This can quite quickly lead to positive outcomes for your relationship. Psychologically, the square is more stable than the triangle. In other words, four people in the room (in this “mini-group” setting) provides a stability that minimises the risk of one individual in the couple feeling marginalised or excluded. 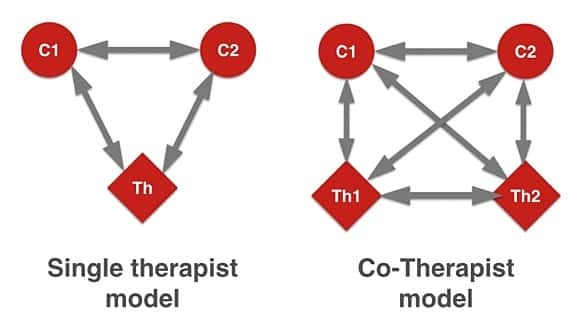 As you can see in the diagram above, the number of potential interactions are much higher than in the single therapist situation. Each interaction or relationship is a source of information for us about your couple dynamics. The chances of “triangulation” are much reduced. This phenomenon can occur in single therapist situations when a client feels that the therapist has sided with one of the partners in the couple. If one of the partners is less keen to come to couples counselling then they can potentially find an ally with one of the therapists that enables them to stay. Some couples find it hard to choose the gender they’d like for Couples Counselling. Here, they get both! As a couple that’s been together since 1999, we ourselves have been through issues and have tried and tested all the approaches and interventions we suggest, on ourselves first. Clients tend to relax when they know that one or other therapist is going to “come and find them” if they get lost in the processes happening in the room. There are two sets of therapist eyes, and this makes the process potentially safer after ruptures. Co-Therapy offers a fresh and different approach when traditional single-therapist Couples Counselling has failed the couple in some way. For some couples, it just feels right! You can think of one or more Co-Therapy sessions as an interview process and a getting-to-know both Ron and Amanda. You are then free to switch to working with just one of us if you feel a particular connection, or if there are budget limits. We believe your relationship is a container which can create the safety and space for each of you in the relationship to grow. Sometimes this container cracks. Our time with you as a couple assists with repair, healing and creating a renewed and healthy relationship. It’s sometimes useful to imagine Co-Therapy as another couple (the therapists), who’ve worked on themselves both individually and as a couple (and who continue to do so), as a temporary scaffold for your own relationship. The therapists gently hold your relationship enough to allow cracks to heal and to allow the underlying creative yearnings within it to reveal themselves.